inch of it, there are still lots of opportunities to see the park in a new light. Not only does the weather change dramatically, but the rivers, snow and ice are different every day. On a partly cloudy day, you can shoot almost all day. The sheer cliffs mean that the sun is always rising and setting off of one cliff or another every minute. Also, the clouds often enshroud the granite faces, making each photograph unique. And there seems to be an endless number of ways to compose every scene. The clouds were moving quickly over the top of Half Dome, and the light looked good, so I put on my dark filter to make a long exposure. Over the course of 30 seconds, the clouds moved a lot and the shadows of the clouds made for some good light across the face of the cliffs. And the moving trees and reflections softened in the reflected light. This is the classic view along the river near the entrance to the valley. Even though there is a nice car park just 100 feet away from where I set the tripod, there was not another person in sight during nearly this entire sunset. I'm not sure why. Probably because it had been raining and even snowing above 6,000 feet elevation until about 20 minutes before I made this image. It was looking almost hopeless, but I could see openings in the clouds developing. And this spot seemed to have the best chance for the best light. I had other plans for sunset, but the light was bad there. 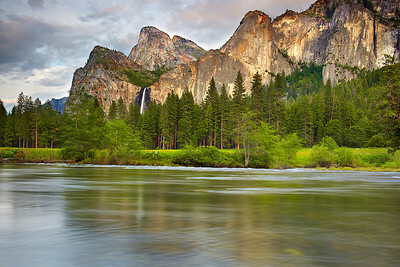 Everything in the frame seemed alive, from the rock and grass in front, to the rapids in the middle, to the light on 3,000+ ft. El Capitan and Bridalveil valls. I carefully composed this scene after waiting for about 30 minutes on a slippery small rock where you had to jump across several other slippery rocks. I should have just taken my shoes off but standing on river-bottom rock for 30 minutes would have torn my feet up and it was snowing at 6,000 feet elevation at this time even though it was June. So the water was cold! It was a nice sunrise, but the best light happened here about 30 minutes after sunrise as the light filtered through the trees in the background. I found this composition and stuck with it. I had to wait for quite a while it seemed for the light to spread into the right places. I wanted a dark background and brighter bushes in front so show how dramatic it feels to be here. Almost everything was moving from the clouds, to the bushes and water. I used a very dark filter so that I could make a very long exposure with relatively bright light. The long exposure was the best way to show just how much movement there was. 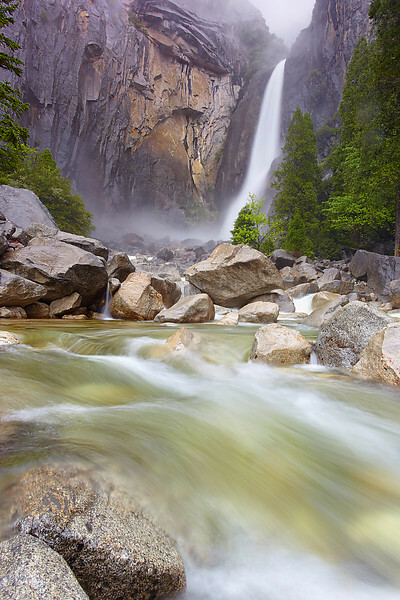 Bridal Veil falls in Yosemite flows year-round, but in the spring it flows at its maximum rate as the high elevation snow melts. I moved around to find an opening in the trees to show as much of the falls as possible. Also, I used a 2-second exposure to maximize the reflections and color in the water. I wanted to try something different at the very popular 'Valley View' area. 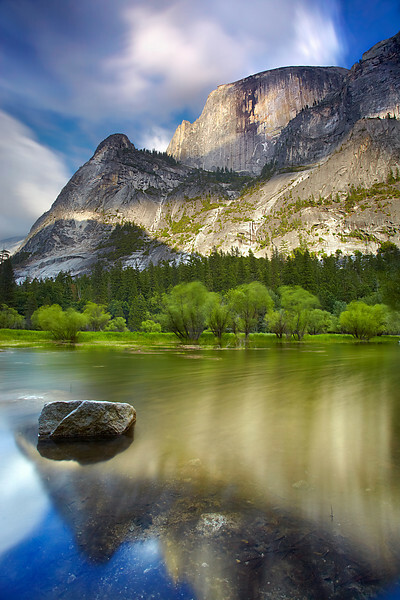 I noticed the glowing rocks under the swiftly moving water and glimpses of the reflected cliffs on top of the water. So I used my very dark filter to make a 30-second exposure in the middle of the day that shows the bottom of the river as well as a bit of reflection from the cliffs behind. Also, the clouds were moving quickly so you can almost feel them moving in the sky in this image. The angle of the sun was getting to be just right for the best view of the 2425 foot high Yosemite falls from the swinging bridge. But it was mostly cloudy. So I waited for an opening in the clouds to light up the falls. A group of photographers and other people had showed up to see the view. They moved bridge around a lot and I wanted a 30-second exposure with my dark filter. I wanted a stable platform, so I climbed down into a small space under the bridge on a concrete piling to make this image! 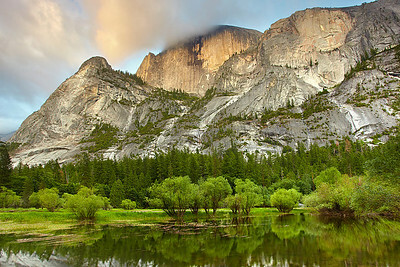 Mirror Lake is a short 2-mile hike from the nearest trail head but it seems a thousand miles away from the Yosemite crowds. As I headed up, everyone was heading down so I had this place all to myself. I was quite surprised. 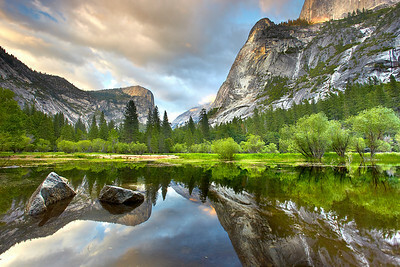 While mirror lake is accurately named, I still had to wait for the breeze to calm down for get these reflections. When it was windy, I put on my very dark filter for some 30-second exposures with streaking clouds and water which look totally surreal. Last light on Half Dome. The warm light filled the entire cliffside giving off a reddish-orange glow. There was nobody here at mirror lake at this moment. I could not believe that I had this view all to myself. 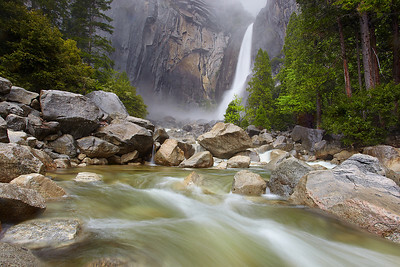 It was a misty and foggy sunrise at 2425 foot Yosemite Falls. Here, only the bottom 320 feet are visible but it is still an impressive waterfall when the volume is high, like on this morning. I got out onto some rather slippery rocks with my tripod and umbrella and managed to get this image after quite a bit of effort. The sound of the falls is thunderous! 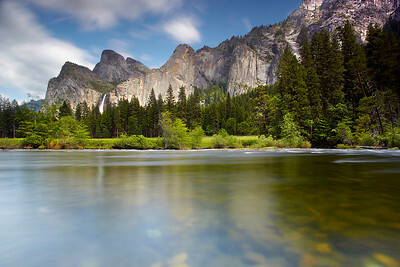 I liked this pleasing curve in the Merced River with El Capitan looming in the distance, so I returned when there was lots of mist, showing how tall El Cap really is! 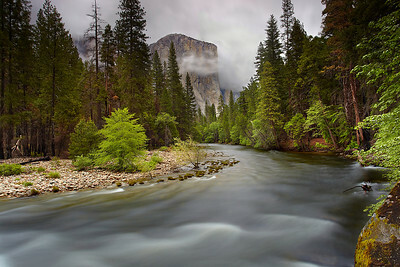 A 30-second exposure smoothed out the flowing water to show how peaceful it felt on this misty afternoon. I won't mention about how I had to hang off of the edge of a burned stump for a half-hour to get this open view. It took a while to get the soot off my hands! 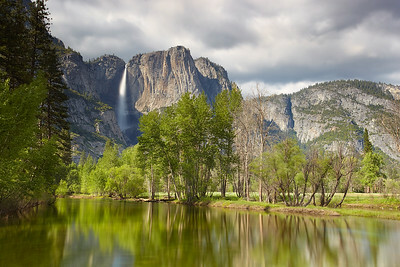 A portrait version of the bottom 320 feet of 2425 foot Yosemite Falls. The difference here is that I wanted to show the texture of the granite rock just 3 feet from the lens and how vertical this place feels. I almost went deaf from the thunderous noise from the falls while waiting for the best time to shoot! Sunrise is best, so as to avoid the crowds and have better light. Topping out at more than 3,000 feet above the 4,000 ft elevation Valley floor, it is the largest monolith of granite in the world. There are a few monoliths that are bigger on the sides of the Andes and Himalaya, but they are not pure granite. 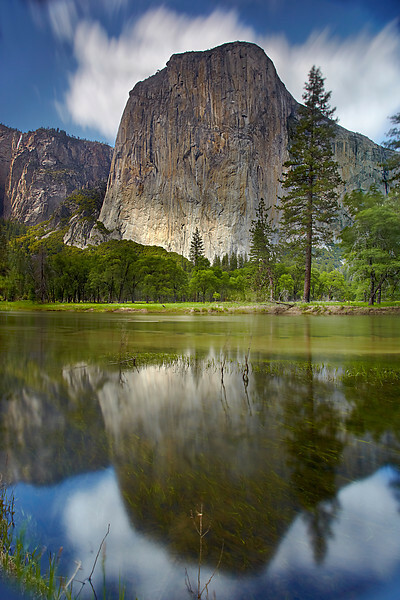 El Capitan is opposite Bridalveil Fall and is best seen from the roads in western Yosemite Valley, including Tunnel View, Bridalveil Fall area, and El Capitan Meadow. 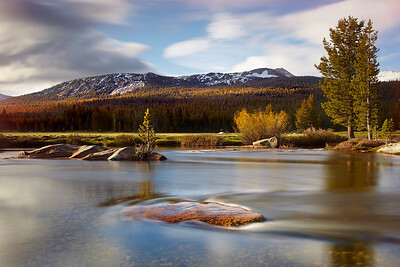 This is a bend in the river near the meadow. I had the lens as wide as I could get it with my 10-stop dark filter on to get a very long exposure to show the clouds streaking ofer the top. This view is huge! 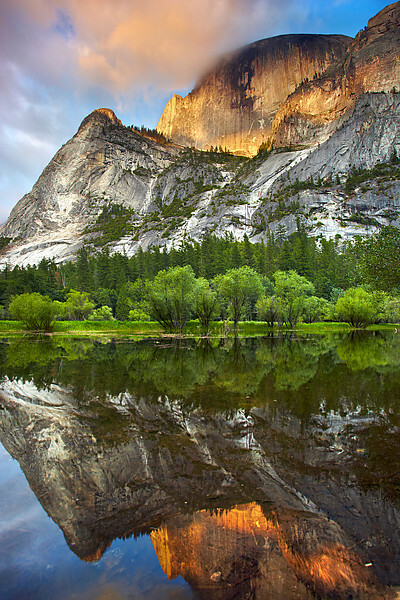 Last light on 5,000+ foot Half Dome reflected into Mirror Lake. I had to perch on a very uncomfortable rock for quite a while until the light became good. One slip and me and the camera would be in the water for sure. There was no other place to get an open view. 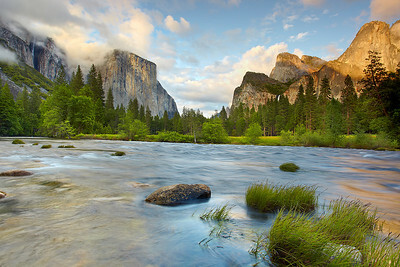 My other Half Dome images were taken on this rock too a few feet away. I try to not have distractions around the edge, so sometimes you just have to get into inconvienient places for an open view! 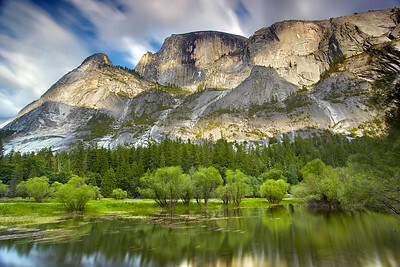 I used my almost black 10-stop filter to create a surreal view of the sky and water surrounding Half Dome. which rises over 5,000 feet from the valley floor. I really wanted to capture the way the light reflected of the wind swept mirror lake. It is not always like a mirror, and that can be good sometimes! You rarely see this entire view in photos because you need a very wide-angle lens to get it all into the frame in one shot.